Home Blog Which Social Platforms do you need as an Entrepreneur or a Startup? Which Social Platforms do you need as an Entrepreneur or a Startup? Social media has become more a priority for businesses and less of an optional marketing opportunity. 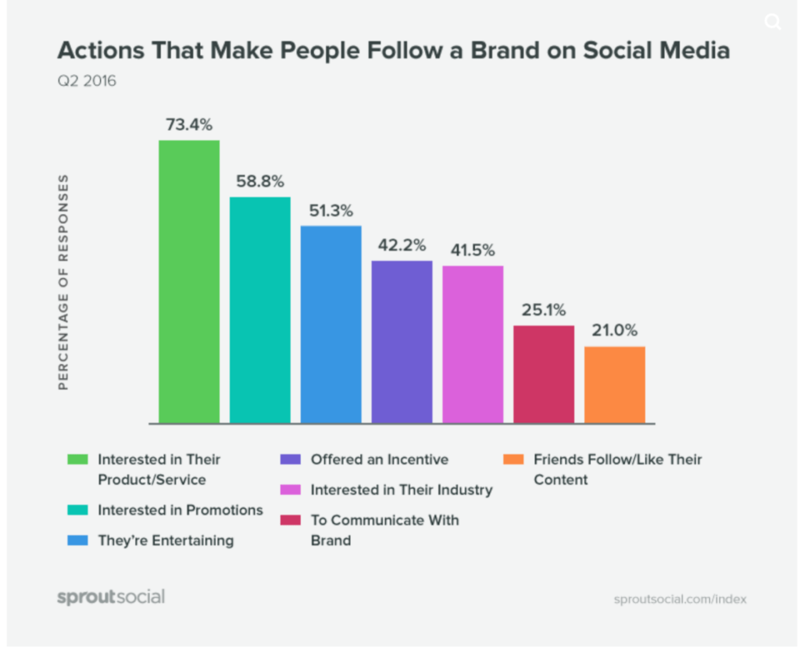 Platforms like Facebook, Twitter and Instagram have become integral parts of brand awareness, content distribution, and lead generation. However, social platforms are not about selling in the first place, but brand awareness instead. People want to get to know the people behind the logo: what values does your business represent, what services and quality customers can expect, how does your company handle complaints, do you treat customers well, and so on. To decide which social media platform fits your company depends on various factors: your product or services, target groups and -countries, gender, age, your budget for advertisements, how much time do you have to maintain a social presence, to actively engage with people, and to keep track on the statistics. Before you choose one or more platforms, you need to research the online social networks. Below you will find a few statistics and their sources as a basis to draw upon to start your own research. Ranked by number of active accounts, the most popular network worldwide, with 2.05 billion monthly active users (August 2017), is Facebook. 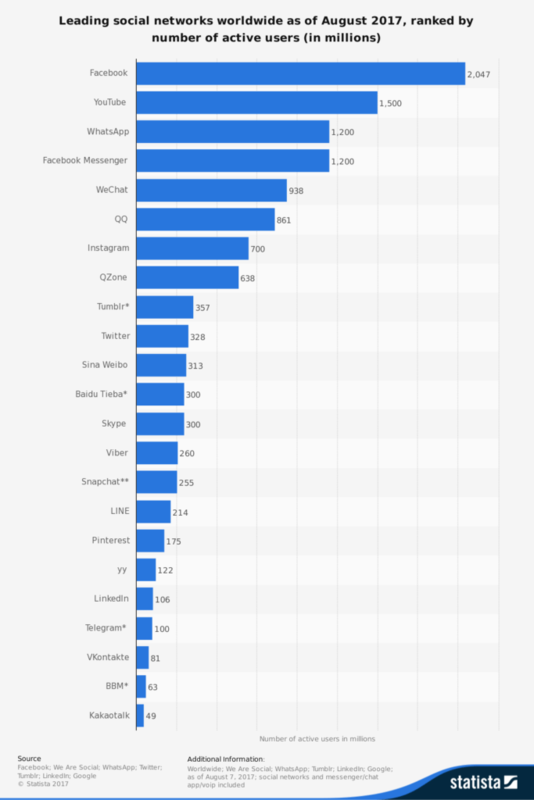 Instagram, seventh-ranked had over 700 million monthly active accounts, and the blogging service Tumblr had more than 357 million active blog users on their site. Considering the age and gender of users: on what platform can you find your audience? Choosing the right platforms depends on your products, services and your target groups. According to Statisca, half of Instagram users are aged 34 years or younger. The majority of the Facebook users in the USA, between 18 and 54 of age and male and female were almost equally spread. Pinterest, on the contrary, has got mainly female users and therefore perfect if you want to sell products that are interesting for this target group. However, the male audience is growing with men accounting for one-third of all sign-ups on Pinterest, and in some countries, the subscriptions by male and female are rated 50/50. Social platforms keep changing and evolving, so your target group can be found in places where you haven’t been thinking of in the first place. It is of high importance to take mobile users into consideration when choosing a social media platform to market your business. Approximately 2 billion internet users are using social networks and these numbers for mobile device users are still expected to grow. 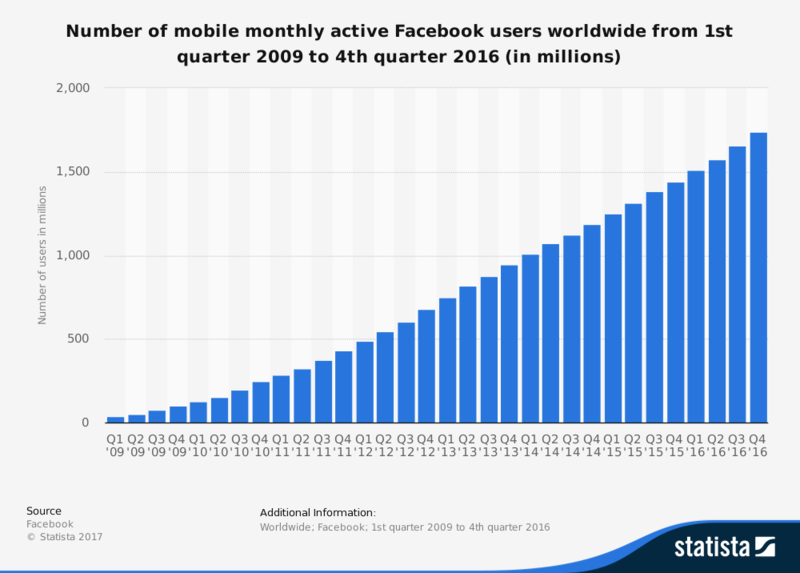 This statistic shows a timeline with the global number of mobile biweekly active Facebook users. Previous PostWhy would you hire us? Next PostBeing Location Independent: a dream or a lesson?